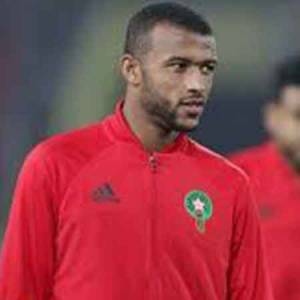 The top scorer of 2018 Africa Nations Championship, Ayoub El Kaabi is a Moroccan soccer player, currently, playing for Moroccan side Renaissance Sportive de Berkane and Morocco National Team as a winger or forward. He has played for Racing Athletic Club Casablanca for a year. El Kaabi was born on 26th June 1993 in Casablanca, MO. He holds a Moroccan nationality. He grew up with his sister. Kaabi's current market value is estimated to be £1.35 million. His national team pocketed $1.25 million after winning a 2018 African Nations Championship and was paid huge bonus. There are no sources of information that could tell about the actual net worth and salary of El Kaabi, it is believed that it could be worth quite a thousand dollars. The rising star, Kaabi began his football career as striker or winger for the Racing Athletic Club of Casablanca where he played for one year from 2016 to 2017. During his one-year career with the team, he scored 25 goals in 18 appearances. Ayoub El Kaabi was transferred to RS Berkane with the transfer fee of £409K on July 1, 2017. During the 2016-17 season, he earned him the top scorer honors with 25 goals in Botola 2, division. He has a contract with the team which keeps him until 30th June 2021. El Kaabi has been active in the international team since 2018 in a 2018 Africa Nations Championship and his first match came on 13 January 2018 against Mauritania, scoring 2 goals. In his second match, El Kaabi scored his first international hat-trick against Guinea on January 17, 2018. In May 2018 he was named in Morocco’s 23-man squad for the 2018 World Cup in Russia. Ayoub El Kaabi has attracted interest from some of Europe’s biggest clubs like Al Ahly, Zamalek, and Atletico Madrid, after a big break in an African Nations Championship. Ayoub El Kaabi led the national team to become the winner of a 2018 African Nations championship. He became the tournament's top scorer as he scored nine goals during the hosts' run to the title, breaking the record for goals scored in the single edition of the tournament in the process. Moreover, Kaabi was also awarded player of the tournament after his Moroccan side defeated Nigeria in the final 4-0 and top scorer honors. After his diligent performance, Atlético Madrid has expressed their desire to sign. He then expected to be selected for the Morocco squad for the World Cup this summer in Russia. Later, El Kaabi was selected to prove himself on the world stage with the national team in 2018 World Cup in Russia in May 2018 as he was named in Morocco’s 23-man squad along with the captain, Medhi Benatia, Mbark Boussoufa and Hakim Ziyech. Additionally, Ayoub El Kaabi is 1.82 m in height i.e 5 ft 11 inches and weighs 79kg. Kaabi still isn't married. Kaabi is currently believed to be single and has not revealed anything about his relationships or love affair.